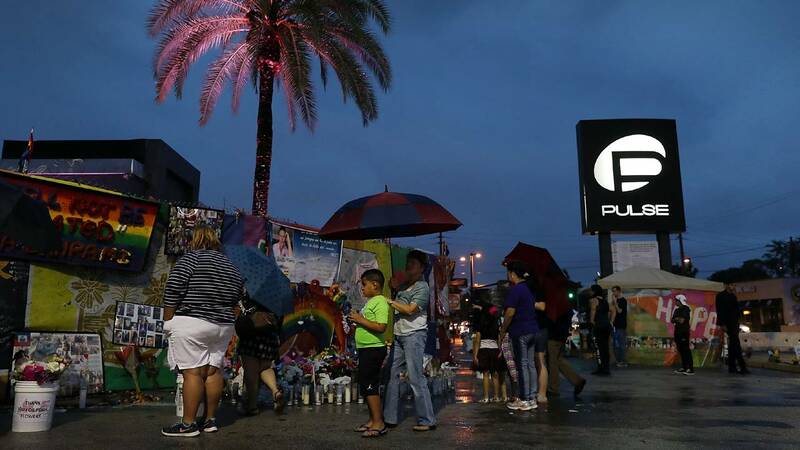 (CNN) - The Orlando police officer who first exchanged fire with the Pulse nightclub shooter is being sued in federal court by survivors and family members of nine victims. Officer Adam Gruler, along with 30 unnamed police officers, and the city of Orlando are accused of violating the civil rights of the club's patrons, according to a suit filed Thursday in U.S. District Court for the Middle District of Florida. In the lawsuit, survivors and family members say some officers stayed outside the club as the massacre took place and others detained uninjured survivors who were running away from gunfire, preventing them from calling their loved ones. Omar Mateen killed 49 people and injured more than 50 others in June 2016 when he opened fire at the Orlando nightclub. Gruler, who worked extra duty as security for Pulse, heard gunshots and engaged in a gunbattle with Mateen after the shooting began, police said. Once Gruler felt outgunned, police had said, he retreated from the club and called for assistance. Gruler "abandoned his post" and "demonstrated a lack of concern for the dozens of patrons in the club," the lawsuit said. Solomon Radner, an attorney representing the survivors and victims, said the lawsuit intends to hold the city of Orlando and its law enforcement "responsible for their actions and inactions." CNN has reached out to city officials and the police union for comment, but they have not immediately responded. In a joint statement, the city and police department said the city "has not seen the lawsuit, nor have we been formally served with the lawsuit" and therefore can't comment further. "Nearly two years after the horrific act of hate inside the Pulse nightclub, our community continues to mourn the 49 lives taken and provide support for all those impacted," the statement said. "On the morning of June 12, 2016, federal, state and local law enforcement officers and first responders put themselves in harm's way to save as many lives as possible. Our first responders are committed to the safety of this community, and they stand ready to protect and serve." Wigberto Capo, whose brother Luis Omar Ocasio-Capo died in the shooting, questioned what would have happened if police officers had acted more quickly. "What if the Orlando police officers who responded to the shooting were aggressive with their plan to rescue victims and hostages and kill the shooter?" he told reporters Thursday. "Would my brother still be alive?" Some officers rushed into the club and pulled survivors out, and later others exchanged gunfire with the gunman, police said. The lawsuit said about 20 officers engaged with the shooter until it became a hostage situation when Mateen was holed up with patrons in a bathroom. Then the officers exited the building and didn't return, it said. Keinon Carter, who was critically injured, said he doesn't want to live as a "lifelong victim." "I believe victims of the Pulse shooting deserve better," Carter said. "We deserve better security protection than what was provided. We deserve to be rescued sooner by law enforcement officers who made strategic decisions to wait." Survivors are asking for compensatory and punitive damages, but the lawsuit didn't specify an exact amount.